Pineapple Capsicum Salad | Simple and Delicious ! 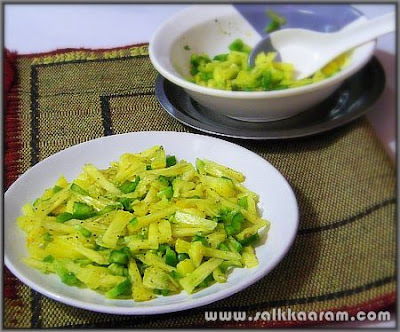 Pineapple Capsicum Salad is an excellent side dish to accompany our biryani! 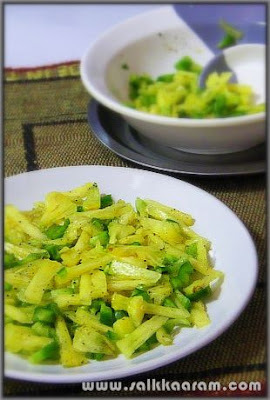 It seems here everyone started loving this sweet, sour and less spicy salad, I see they prepare it often. I can't leave without mentioning the chef, happened to meet her once when she came to help us. She is working hard to raise her children and to look after her sick husband. Today one of her daughters is getting married and still they are waiting for help from kind hearts.. May Almighty bless her and family, please include them in your prayers..
Chop pineapple into thin slices. Chop capsicum into small pieces. thank u seena for some thing new variety.